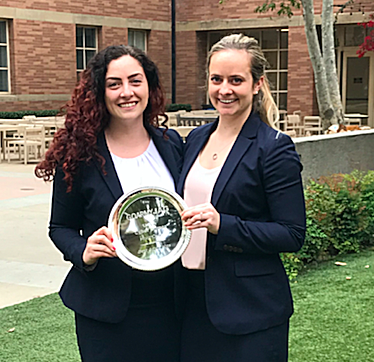 HCC law clerk Kelsey Peck recently won the award for Best Overall Oral Advocates at the UCLA Cyber Crimes Moot Court Competition in Los Angeles. UCLA School of Law Cyber Crimes Moot Court Competition is an annual moot court competition open to law schools across the nation, exploring cutting-edge issues in the field of cyber law. Kelsey and her teammate Allison Regan are second-year law students at Roger Williams University School of Law. Kelsey (pictured at right) has been serving as a law clerk at HCC for the past year and will continue her work at the firm as a summer associate. This UCLA Moot Court Competition featured an esteemed panel of renowned cyber law experts to judge competitors’ oral advocacy. In addition to the Competition, participants and judges heard from thought provoking speakers identifying new developments in the practice of cyber law, according to the UCLA School of Law website.